This creation of this document was galvanized by the Global Challenges Foundation’s New Shape Prize in 2017. At the time, the prospective authors were a loosely connected group of friends and acquaintances scattered across the Americas. Each of us worked to make the world a better place in our own way, and each of us struggled with the slow, even glacial, progress of global issues. The competition is not looking for blueprints for solving the individual issues in question, or to avert specific risks. Rather, entrants should focus on designing a decision-making structure or framework that could galvanize effective international action to tackle these risks. The proposed model may encompass an entirely new global framework or a proposed reform for existing systems. The task is not to come up with direct solutions to specific problems. Rather, it is to design a general model for decision-making, with the aim of generating such solutions and the ability to do so, and possessing the resources to effectively implement them. Submissions must involve a minimum of limitations to the sovereignty of nation-states, meaning that it should involve only such limitations as are necessary to ensure that national decisions do not seriously harm the vital interests of inhabitants of other countries, or of humanity as a whole. The prize question and timeline helped to focus our efforts. Based on these parameters, we undertook several months of structured research and debate. Our efforts yielded insights, both encouraging and concerning. We began to perceive the sheer magnitude of both the problems facing the world and the efforts already underway to fix them. Comprehending humanity’s successes and failures throughout history – and the many opinions about how they happened – made us realize just how difficult it would be for us to propose ideas that would have any hope of significantly improving the state of the world. But neither baseless optimism nor unproductive pessimism were acceptable to us. We sought possibilities for hope, but they needed to be possibilities that could withstand our measured skepticism. Finally, as the prize deadline loomed, we began to glean what seemed to be robust insights into the state and trajectory of the world. Many of the constituent pieces of this story had been with us for a long time, but it was a profound challenge to find a vision of the present and future that encompassed all of our most crucial insights into a cohesive whole. This document is the culmination of our efforts to perceive the possibilities for humanity’s political future. Improvements in global governance are required for humanity to thrive through the coming decades. Today, evolution of global governance is limited primarily by the ability and willingness of the world’s nations to cooperate. Creating a centralized vetoless global legal authority – a sovereign global government – would require the ceding of unprecedented sovereignty by all nations, an infeasible goal for the near future. However, effective governance is still achievable without such a central authority. With minimal modifications, today’s global governance structures are capable of articulating and embodying the extent of humanity’s willingness to cooperate. As global cooperation improves, global governance can be expanded and empowered. Today, global cooperation is primarily constrained by the fact that nations have limited mutual trust and goal alignment – the extent to which national governments have similar priorities. Improving both of these factors is imperative for the continuing evolution of global governance. Strategic evolution toward these goals appears to be possible via minilateral game changers – policies requiring minimal coordination to implement but which can significantly improve global trust or goal alignment. Combining a disciplined evolution of global governance structures with the pursuit of minilateral game changer policies will make it possible for humanity to gradually implement broader and deeper global governance to solve key global challenges over the coming decades while also accumulating the experience needed to safely create a sovereign global government. Global governance faces an array of concerns. It must not only solve enduring problems like war and climate change, it must also provide a structure for navigating newer and more difficult problems such as the prospective dangers of emerging technologies. Moreover, safeguarding humanity from technological risks requires the alleviation of failures to thrive such as internecine violence and extreme poverty. Lastly, global governance is expected to facilitate significant improvements in human wellbeing. Existing technologies have great potential to improve global wellbeing, but even those important changes may pale in comparison to the transformative potential of widespread automation. Global governance will play a key role in shaping these transformations for the good of all. We introduce the cooperation possibilities frontier to illustrate the difficulty of global governance problems and the world’s current ability to solve them. To solve each major global governance challenge, some degree of sovereignty must be ceded by some number of countries. The frontier illustrates the limits of global coordination at a given time, ranging from a few nations cooperating deeply to many nations cooperating shallowly. Creating a sovereign global government necessitates the ceding of extreme amounts of sovereignty by all nations, making it infeasible to achieve in the near future. Moreover, the primary impediments to cooperation are limited trust and goal alignment among nations, both of which are very slow to change. There are no “silver bullet” solutions to the world’s problems. However, incremental improvements to global governance are possible even when cooperation is limited. Existing institutional designs can be adapted to iteratively improve their effectiveness. New narrow-mandate global institutions can address emerging problems while old institutions are incrementally strengthened. Funding a growing UN can be achieved through the formalization of existing funding patterns and the addition of new taxes that the UN is well-positioned to levy. In parallel with these centralizing developments, national and subnational governments will also be increasingly involved in global governance. Through transgovernmental networks, governments interact with each other and with non-governmental organizations to address transnational concerns. Over time, these informal networks can lay the groundwork for topic-by-topic evolution towards global laws, norms, and institutions. In other cases, transgovernmental networks such as a proposed coalition of cities may be well-positioned and strongly motivated to directly address global goals such as preventing climate change. This layered structure creates overlapping purviews, where issues of transnational concern may be addressed by one or more systems even while others are deadlocked, a feature we term jurisdictional optionality. Furthermore, global solution networks can combine the strengths of local and global institutions to achieve global goals. The evolution of both the UN and global governance networks will be shaped by a vast and growing group of increasingly empowered global political actors from business, civil society, and every level of government. This pool of political actors is staggeringly diverse and increasingly capable of meaningfully engaging on many subjects simultaneously; we term this group the multi-focal myriad. Nations and their populations have a multitude of tools for influencing other nations and peoples. We term this many-faceted power the diplomatic depth of a nation and its people. Applied systematically, the tools of diplomatic depth can be used by an existing majority to incentivize all actors into cooperation to provide global public goods. Solving the various challenges of global governance will also require significantly bolstered global cooperation. Three avenues of effort seem the most promising: building trust between nations, aligning the priorities of nations, and improving the stability of all nations. Strategic action towards these goals appears to be possible via policies which require minimal coordination to implement but which have far reaching effects, which we call minilateral game changers. Six categories of strategic action are explored: building capacity and momentum for global governance reform; adopting holistic security, which aims to solve the underlying economic and social roots of conflict; nurturing and governing the global digital commons to allow unprecedented connectivity between the peoples of the world; deploying digital tools that can positively transform governance and discourse; implementing policies to help societies thrive as automation becomes widespread; and pursuing peaceful political convergence by strongly prioritizing the evolution of existing national political systems. Global governance is possible even in a world with no central authority and limited cooperation. Existing governance structures can be incrementally evolved. Policies can be implemented to elicit broader and deeper cooperation in the long run. Taken together, these strategic developments will make it possible for humanity to solve global challenges in the coming decades and accrue the experience and mutual trust needed to build a sovereign global government. The central challenge of our time is cooperating with each other. Our prospects for solving key problems like war, climate change, and poverty arise from the depth and breadth of political coordination that we can muster at the global level. The goal of this work is to describe how this challenge can be overcome. If the world is successful in this endeavor, humanity will experience an era of unprecedented peace, security, and prosperity. Deep and lasting global coordination is necessary for humanity to thrive into the distant future. Such an ambitious plan must be rooted in a deep and thorough analysis of relevant facts and arguments. This work will provide an outline of that analysis and the literature that supports it. Some of the problems humanity faces are woefully familiar. War, for example, is an old adversary. It took humanity until the latter half of the 20th century to assemble a body of incentives and political structures that could create significant and lasting peace – or at least peace that has lasted to this day. This peace, however, is by no means complete; nor is it guaranteed to survive the spread of new technologies and beliefs. Conflict still exists, typically in the form of civil wars and internationalized civil wars. Hostilities everywhere in the world are now subject to a multitude of conflicting external influences that can lead to their perpetuation and escalation. Worse still, emerging technologies such as ballistic missile defense and combat drones may weaken global military restraint, thus unravelling the hard won lessons of the 20th century. As the problem of war continues to evolve, so must our solutions. To create permanent peace, global governance will need to navigate a tangle of incentives, beliefs, and technologies. Despite the enormous positive steps taken after the world wars, nations across the globe continue to prepare for armed conflict because they realize that this problem has not been definitively solved. The relative peacefulness, openness, and stability of the last several decades has set the stage for widespread human flourishing as well as the emergence of new second-order problems. For example, the unprecedented advancement of human wellbeing and prosperity has been based in large part on the use of fossil fuels, thus exposing us to climate change. Progress has also let us set our sights higher as a species, both for what we consider to be the right trajectory for humanity and for our own conduct. Global governance is thus obligated to achieve much more than avoiding catastrophe, it must also alleviate failures to thrive such as internecine violence, poverty, lack of education, and human rights abuses. Major advances in human wellbeing can be accomplished with existing technology and modest improvements in global coordination. Technological advancement may soon expose us to unprecedented risks. It is instructive to recall that building a nuclear weapon requires rare and protected materials, highly educated people, and a significant industrial base. By comparison, future technologies like artificial intelligence (AI), biotechnology, and nanotechnology may allow small groups with minimal resources to cause widespread devastation. Whereas today only a few governments could end civilization, decades hence there could be many groups with that capacity. Risks to humanity can be categorized by the degree of coordination needed to mitigate them (see Figure A). An asteroid impact is an example of a best-shot risk, where everyone benefits as long as someone deflects the asteroid. Summation risks like climate change require the aggregate action of many actors. Lastly, weakest link risks require action from every actor. For example, if any nation allows a lab within their borders to engineer a global pandemic, everyone is at risk. Mitigating weakest link risks may require global law enforcement, a colossal coordination problem. Since the instability caused by failures to thrive can hinder the enforcement of laws, the failure to thrive of humans anywhere can pose a risk to all of humanity as technology advances. Summation problems like climate change may pale in comparison to the risk posed by emerging technologies. Numerous thinkers have called attention to the great potential for AI, biotechnology, and nanotechnology to do both good and harm. If a global regulatory regime attempted to slow or control their development, states may choose to defect in a bid to unlock capabilities that no other state has. We should expect the emergence of at least one new weakest link risk during this century. Definitively averting these risks will require deep and global cooperation, an unprecedented challenge. The future also holds vast potential for the advancement of the human condition. Recent advances in robotics and AI allow for the automation of large parts of the economy. This may soon allow the creation of a post-scarcity civilization, which can meet the basic needs of every person at no cost to the individual. If we can marshal our collective will to build such a system, we will not only end global poverty, we will likely cause a more profound transformation of the human condition than that caused by the industrial revolution. Unfortunately, this radical development has a potential dark side. The same technologies that can liberate humanity from drudgery can liberate us from each other. The rich may no longer need workers; dictators may not need their people. This could lead to greater neglect of human flourishing and an increased likelihood of violence. Given that all governance already struggles to reconcile the rights and powers of the elite with those of the poor, widespread automation could stretch these social connections to their breaking points. Protecting the rights and liberties of all people as human labor fades from the global economy will be a vast ethical, logistical, and governmental challenge. Global governance must not only solve enduring problems like war and climate change, it must also provide a structure for navigating newer and more difficult problems. Moreover, it is increasingly judged not only by the extent to which it prevents harm, but also by its demonstrated ability to improve human wellbeing. If global governance is to succeed, it must elicit deep global cooperation on a wide variety of issues. Exploring solutions: What is the world capable of? One way to visualize the challenge of global governance is to consider the global cooperation possibilities frontier. 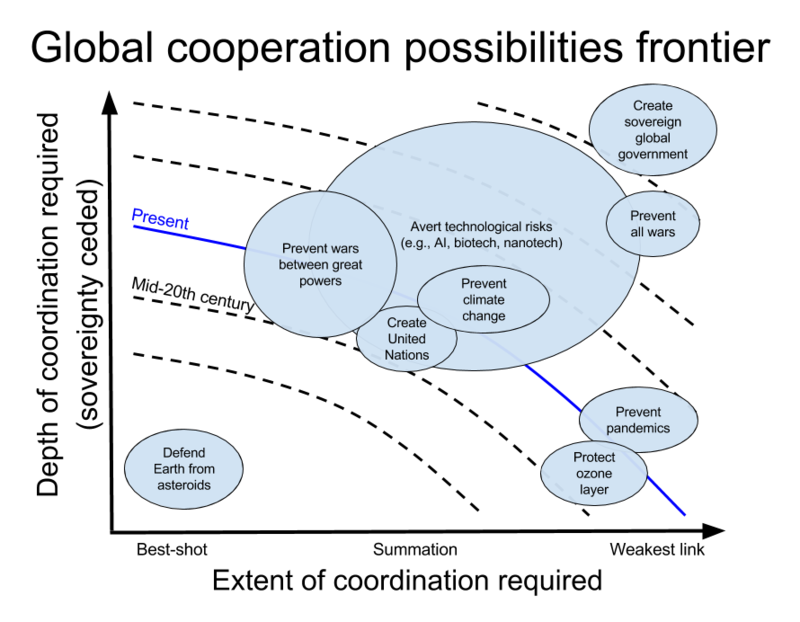 Figure A illustrates the difficulty of solving various cooperation problems according to: 1) how much sovereignty must be given up by national governments (e.g., definitively ending all wars means that no nation can choose to go to war) and 2) the extent of coordination required between governments (from best-shot to weakest link). Each arc from the upper-left (much sovereignty ceded by few nations) towards the lower-right (little sovereignty ceded by many nations) is an example of the global cooperation possibilities frontier. Each frontier conveys a sense of the limits of global cooperation at a particular time – where coordination problems below the frontier might be solvable but those above the frontier are not. The frontier has expanded since the mid-20th century, but further progress is not guaranteed. Figure A: The global cooperation possibilities frontier. We posit that creating a centralized vetoless body with ultimate legal authority, which we term a sovereign global government, would require all nations to cede extreme amounts of sovereignty, thus placing it in the far upper-right of Figure A. Given the world’s ongoing difficulty with significantly easier problems like climate change and pandemics, it is clear that humanity is far from ready to build a sovereign global government. This work is guided by two insights from this analysis. First, we cannot assume that global cooperation far beyond the frontier is achievable anytime soon. Every governance structure and implementation policy explored here is within the present or near-future frontiers. Second, expanding the frontier is crucial if we hope to build significantly deeper global governance. Two major factors currently limit the extent of the global cooperation possibilities frontier. First, nations often have radically different short-term goals. Deep cooperation on many topics may be unattainable at present because there is no consensus on global priorities. For example, developing nations tend to prioritize their own economic development above other concerns such as efforts to combat global climate change. In general, the relative goal alignment of the world is strongly dependent on the political, ideological, and economic similarities between nations and peoples, all of which tend to change very slowly. Second, many cooperative efforts between nations either fail because of a lack of trust or are never attempted at all. Nations will not voluntarily cede sovereignty to systems that they do not trust. Improvements in mutual trust cannot be assumed; they must be earned. Global trust has grown slowly in part because while prosocial policies can build it over time, a single antagonistic action can undo many years of progress. Rapid growth in global trust or goal alignment is unlikely, but slow positive change is both possible and highly desirable. Examining the problems of global coordination in depth brings us up against the dizzying array of conflicting incentives, beliefs, and laws that comprise our world. We join political scientists like Hale, Held, and Young in concluding that no “silver bullet” solution exists. The world’s only navigable path forward is a multi-faceted and iterative approach. We therefore deal in broad strokes rather than details; outline productive avenues of progress rather than panaceas; and strongly favor evolutionary rather than revolutionary change. Our solution has two parts. First, we describe a workable structure of global governance and how it can evolve from the existing global order. Second, we explore strategic actions that can dramatically improve humanity’s ability to cooperate in the long term, focusing on policy prescriptions that show the greatest promise for positively affecting global goal alignment, trust, and stability. Neither section is exhaustive due to the limited scope of this work. The structures and policies we explore are prominent illustrative examples of these central themes. Functioning global governance can be achieved even when cooperation is limited. Existing governance structures can be evolved and existing patterns can be reused to incrementally solve global governance problems. Moreover, if humanity succeeds in improving global trust and goal alignment over the coming decades, these structures are poised to articulate and embody the rising tide of cooperation. Despite its many resonant successes, the United Nations (UN) and its institutions need to be reformed and expanded if they are to solve current and future global challenges. We believe an evolutionary approach that builds upon the existing international order is preferable to a revolutionary approach that causes major upheaval of functioning systems. If the UN fails to evolve, a whole range of global governance institutions would have to be invented to replace it. We offer no reforms of the central decision-making bodies (i.e., the GA and SC). We posit that global governance would still be largely deadlocked today even if they were improved or replaced. We expect that political coalitions will arise to achieve reforms of these bodies in the coming decades, but each round of changes will yield only marginal benefits to global governance. Here, we focus on practical expansion and improvement of global governance that can take place whether or not these bodies are reformed. Incremental progress can improve global trust and goal alignment in the long run, thus setting the stage for successful and significant reform of the central deliberative bodies. Narrow-mandate institutions like the World Health Organization (WHO) can solve crucial global problems without a major loss of national sovereignty. Institutions are valuable because they transform single-shot interactions into ongoing relationships in which bad behavior can be punished; they reduce total transaction costs; they house independent capacity to monitor and enforce compliance with agreements; and they provide a central forum that can embody norms as they emerge. Successful institutions can also earn deep trust over time, thus inspiring optimism about humanity’s ability to cooperate globally. For example, the WHO has earned the trust of nations and peoples through decades of successful efforts to improve the human condition globally. UN member states should continue to build narrow-mandate institutions to solve transnational problems and provide global public goods. Furthermore, they must ensure that global institutions, new and old, are strong enough to accomplish their mandates. The most effective bureaucracies are professional, powerful, and moderately independent. Many existing global institutions have a cohesive mandate but lack the capacity to fulfill it. UN member states can bolster these institutions in numerous ways, such as increasing their funding; size; independence; inspection and enforcement powers; and agenda-setting power in the GA or SC. The UN will need guaranteed funding to become a true global government. We see four related paths forward. First, all diplomatic actors can encourage nations to fulfill funding commitments. Second, this norm should be codified into binding agreements among a growing coalition of willing states. Third, as we explore later, fortifying our economic system against the destabilizing effects of automation by levying a global wealth tax would provide an enormous amount of funding. Finally, the UN may be well-positioned to tax conspicuous resources such as satellites orbiting the Earth; solar and lunar Lagrange points; the orbits and Lagrange points of other planets; interplanetary trade flows; and the large-scale extraction of natural resources on Earth, particularly in international waters or Antarctica. Since some funding sources influence policy, we advise against heavy dependence on any single revenue stream. Transgovernmental networks are coordinated efforts by sub-national or independent non-governmental organizations to overcome transnational problems. Networks of this type are increasingly prominent and prevalent (e.g., the C40, the World Economic Forum, and the Financial Stability Board). Countries should add participation in transgovernmental networks to the domestic duties of government officials and hold them accountable for their conduct in both realms. These networks often lack transparency, but modern technology can help alleviate this. Open-access records allow non-government professionals to examine the actions of transgovernmental networks, increasing their transparency and visibility. We recommend that formal transgovernmental agreements be collected and made publicly accessible in a centralized place akin to the UN Treaty Collection. Transgovernmental networks must ultimately be directly subject to the laws, norms, and principles that exist in the international sphere. Where applicable, transgovernmental networks should adopt the principle of comity (the mutual recognition of laws) and the principle of legitimate expectation (where reasonable expectations not explicitly written into a contract are still enforceable). Strong economic incentives exist to harmonize key governance practices across jurisdictions. Many existing transgovernmental networks are focused on solving these narrow problems. However, it is also possible for members of legislatures and judiciaries to form similar networks, allowing them to work together towards global standards. Encouraging such networks would promote unity, integration, and disaggregated sovereignty – the ability of a nation’s various institutions to influence, govern, and elicit action, both domestically and transnationally and in turn to be influenced by the institutions of other nations. As these networks evolve, they should be encouraged to increasingly integrate with UN institutions in their domain so that both systems can benefit from each other’s legitimacy and capacity. In the long run, informal networks can provide the initial groundwork for topic-by-topic evolution towards the global laws and global institutions that would replace them. An example of a prospective transgovernmental network is a coalition of cities – a globe-spanning system of governance that uses as its foundation the preexisting legitimacy and capacity of municipal governments. Cities should be amenable to a coalition because many of the world’s problems are most evident in cities. A coalition of cities could explore solutions to those problems by drawing upon their shared experience. For example, cities are well-positioned to advise each other on how to solve the many challenges associated with rapid urbanization. It is not always necessary or practical for a single body to unilaterally solve a given problem. In fact, global efforts like those to eradicate smallpox and malaria have been more successful when parties from multiple organizational levels worked together. Three major patterns of effective collaboration are evident. First, international actors (such as the WHO) can partner with existing local groups and thus gain crucial local expertise, trust, and resources. Second, grassroots initiatives by individuals and groups can be spread and amplified by the resources and networks of international actors (such as agro-forestry innovation in the Sahel). Third, global funds (such as the Global Fund to Fight AIDS, Tuberculosis, and Malaria) are a proven method for scaling up effective existing solutions to widespread problems. They should be employed more widely to address global problems for which scaling of known solutions is needed. Today, noteworthy global voices come from all nations and all levels of government as well as business, religion, and secular civil society. Similarly, all of these fora are addressing global issues, each with its own focus and abilities. In the digital age, every connected individual can follow numerous issues and maintain a global network of peers. Over the coming decades, we should expect increases in both the diversity and representativeness of global governance actors as well as the number of topics each actor can meaningfully track. We call this evolving group the multi-focal myriad. While the multi-focal myriad can act in many ways, its ability to influence the behavior of entire nations and peoples is crucial for the development of global governance. Nations today have a multitude of tools at their disposal for influencing each other. These include the typical tools of foreign policy such as diplomacy, development assistance, economic sanctions, smart sanctions, weaponized finance, and military action. There are also less traditional methods like engaging the media; pressuring third-party nations; and economic, diplomatic, or reputational incentives. Furthermore, the peoples of the world have their own diverse tools of influence, including public discussion, donations to institutions, divestment campaigns, and boycotts. Taken together, we term this multitude of capabilities the diplomatic depth of a nation. It represents the capacity of a government and its people to change the behavior of other governments and peoples. If a strong coalition already exists to advocate for the creation or management of a global public good, the tools of diplomatic depth can be used to incentivize broad cooperation. By taking action based on the value of the public good, a large enough group of nations can apply broad pressure to incentivize previously noncooperative states into cooperating. Pursued systematically, this strategy can result in a cooperative Nash equilibrium. This result depends on the strength of the coalition’s commitment to the declared goal, how much cooperation would cost the noncooperative states, and what all states would gain if broad cooperation is achieved. Combining the many tools of diplomatic depth with verifiable independent analysis of the facts will allow the nations and peoples of the world to have a good chance of creating and maintaining public goods even without a centralized authority. The actions described in this section were chosen for three major reasons. First, each has the potential to notably improve humanity’s ability to cooperate in the long run. Second, there are strong reasons to believe that crucial political actors will be galvanized to implement these policies on a relatively short timescale (ranging from the present to a few decades in the future). Finally, each appears to be a minilateral game changer, a goal that requires minimal coordination to achieve but which would have a strongly positive effect on the world’s overall ability to cooperate. The progress of governance reform requires the development and advancement of good ideas. Given the high stakes and great complexity of the problems, expert analysis is crucial. To increase its quality and impact, this analysis should be centralized, systematized, and formalized. A coalition of UN member states would be able to make three key contributions in this area. First, they could design and implement a systematic approach to UN reform, such as recurring summits on the topic. This would build crucial momentum for governance reform and “institutionalize” parts of the reform process, thus reaping some of the benefits of institutions described earlier. Second, they could build introspective institutions mandated with analyzing the design, processes, and activities of UN institutions with the goal of recommending improvements. One such institution could examine UN agencies; another could examine the secretariat itself. Lastly, they could create an advisory institution focused on discovering opportunities for simplifying the forest of international agreements and organizations. While diverse approaches can be very useful, dramatic growth in the number of fora has contributed to international political gridlock. A professional high-capacity institution could highlight opportunities for simplification as well as damaging discrepancies. These actions within the UN system have analogs within civil society. The Global Challenges Prize, for which this document was prepared, is a prominent example of this strategy. Inside or outside of government, a small group of motivated actors can find ways to elicit analysis of problems that matter. In the context of Figure A’s illustration of the global cooperation possibilities frontier, this sort of analysis can move coordination problems down and to the left, making them easier to solve. Security is crucial for cooperation in numerous ways. Not only does it undergird global trust and goal alignment, it is also imperative for the stability of societies. No nation can ensure its long term security if it develops only the military dimension of its foreign policy. To create lasting peace, nations must engage deeply on other fronts such as economic development. Within the domain of terrorism, large-scale military responses are not only ineffective, they are counterproductive. Terrorism tends to be rooted in deep cultural grievances, economic stagnation, inequality, and the absence of hope for a better future. Broadly similar conclusions have been drawn about the roots of most forms of armed conflict in the world today. Political actors face the challenge of integrating these findings into their policies. Nations must strive to achieve a closer balance and synergy between their military and humanitarian strengths. In purely practical terms, the continuing safety of even wealthy nations hinges in part on the extent to which they promote global prosperity and hope. This policy is a prime example of a minilateral game changer. Even a small number of wealthy nations shifting a fraction of their military budgets toward aid would reallocate billions of urgently-needed dollars. The delivery of aid today is increasingly guided by research on its effectiveness; while some forms of aid have been proven to be unproductive, others have been shown to be dramatically effective. Moreover, this policy would sow goodwill and positively influence global norms, making it more likely that other nations will act similarly. Prosocial action today by a few nations could make the security and cooperation challenges of future decades much easier to solve. Digital communications systems are connecting humanity on an unprecedented scale. Physically, the Internet is a set of open standards implemented on globe-spanning infrastructure that is evolving towards universal connectivity. Linguistically, real-time machine translation is bridging the chasms of language between peoples. As with many powerful technologies, digital communications technology is dual-use, meaning that people can use it to both help or harm. While it can connect and empower humanity in tremendously positive ways, it also allows for the creation of frightening constructs that were once limited to science fiction, such as universal surveillance and automated censorship. Charting a course toward positive outcomes will be a non-trivial endeavor for every society, but results so far indicate that an open and secure digital commons is overwhelmingly preferable to the alternatives. Politically, we need to defend the global digital commons against efforts to undermine or capture it. States have strong incentives to surveil and control all information in their territories. Likewise, telecommunications infrastructure companies are highly incentivized to seek “gatekeeping” power over all content, giving them tremendous power to filter information and shape public opinion. Within states, defending the digital commons requires new laws to ensure that no party can gain such control. Between states, iterative rounds of norms and agreements will need to be created, spread, and enforced over the coming decades. Today, access to the global digital commons is increasingly regarded as a human right, but concrete action must follow from that recognition. A global digital commons allows for the unprecedented exchange of culture. We have the opportunity to learn each other’s values, fears, and dreams. The resulting mutual understanding can provide a sturdy foundation for trust, thus allowing us to cooperate more deeply. Building atop the network of the global digital commons, digital tools have great potential to transform our social and political systems. To ensure that this transformation is positive, technology needs to be widely deployed toward humane ends. This requires that technologists ally with other actors in the multi-focal myriad. We will examine three such opportunities. First, trustable technology is within our grasp. The combination of zero-knowledge proofs, biometrics, and blockchains may allow digital identity systems to achieve near-perfect security. These systems will remove key roadblocks in the implementation of digital democracy. With low-cost but secure voting systems, representative democracies can easily add elements of direct democracy. Second, existing technologies can be combined into a decision-support system for governance. Collaborative systems such as Wikipedia have proven that a rule-bound editorial structure can aggregate widespread efforts to produce a vast knowledge construct. Applying these lessons to political discussion and rulemaking enables the creation of a wiki democracy platform, which would allow widespread engagement to be mediated by rule-based structures. Just as Wikipedia is not the unfiltered opinion of the masses, nor would a wiki democracy platform be just another source of political noise. It could constructively aggregate and elaborate people’s beliefs into more actionable forms, providing crucial data for political decision-making. Initially, such systems would carry no legal power, but could eventually be combined with the digital identity systems discussed above to create a capable e-government platform. A broadly-adopted wiki democracy platform could grow into the central political discussion and analysis platform for a nation – and eventually for the world. Finally, technological tools are needed to help overcome the rise of “echo chambers” and weaponized memes. Echo chambers are not new, but modern technology allows automated filtering of the world’s information. Memes are now being designed to exploit human cognitive biases and then employed on a vast scale to convince people of falsehoods. “Recommender” systems provide individuals with content similar to what they’ve shown interest in before, creating a cycle of apparent confirmation of their current beliefs. If we do not counter these developments, human society is in danger of permanently fragmenting along preexisting lines of belief and authority. To achieve an open and lasting global forum of ideas, we need tools that can help people guard against the systematic exploitation of the innate vulnerabilities of human thought. Modern digital tools can provide the multi-focal myriad with powerful new abilities. They can help every social and governmental system become more effective and empower everyone with greater access to verifiable information. A multi-focal myriad so empowered would be much better positioned to both agree on and act on global priorities. The social and economic fabric of our societies will face tremendous challenges from automation over the next few decades. If these challenges are not addressed, they seem likely to cause widespread instability even within historically stable nations. Instability of this sort is likely to dramatically curtail humanity’s ability to cooperate globally. Here we briefly highlight ways to constructively manage this transformation. Capital ownership has been a hotly discussed subject for centuries, culminating in recent analysis indicating that dramatic inequality is the equilibrium under common conditions. However, this disturbing result did not consider the further effect of widespread automation. Recent spectacular advances in AI and practical robotics have set the stage for impending widespread automation in many common professions, such as driving vehicles and service labor. In the very long run, automation will dramatically reduce or even eliminate the need for human labor of any kind. Here, we will focus on two key government policies for stabilizing society through this transformation. First, nations need to incrementally build or expand their social welfare systems or adopt universal basic income. With automation subsuming entire categories of jobs, many (and eventually most) people will not qualify for any work that can support them and their families. It will be difficult but necessary for market-driven societies to recognize that all individuals have a right to wellbeing regardless of their contributions to the economy. Second, there are strong practical reasons to prefer an economic system that combats inequality with a wealth tax and the advent of widespread automation will dramatically increase the need for this policy. Avoiding capital flight will require that deployments be led by large nations or trade blocs. Eventually, the policy will need to be effective globally in order to address the problem of tax havens. Practical steps can be taken by national and international governments toward this goal, beginning with wealth assessments. Securing government financing via a globally-imposed wealth tax will not only help stabilize the public finances of all countries, it will easily fund global government. The UN today spends billions of USD per year, a tiny amount compared to the hundreds of trillions of USD in global wealth. Even the significantly expanded global government described here could be funded through a small fraction of a 1% annual wealth tax on large fortunes, with the remainder going to local and national governments. A wealth tax is a policy goal with far-reaching implications for the stability, capability, and morality of societies. Implementing such a policy may be a significant political challenge, but once achieved it can provide vast resources for all levels of government. Societies that succeed at this transition will be much better positioned to cooperate with each other to provide global public goods. Nations that are more similar to one another tend to trust each other more. When a nation has an open political discourse, its commitments tend to be highly credible. For these reasons and numerous others that are left unstated, political convergence towards openness has the potential to enable very deep global trust and cooperation in the long run. At present, the economically, militarily, and culturally dominant bloc of nations has demonstrated a commitment to democracy, liberalism, and human rights. These nations are underpinned with representation, the rule of law, checks and balances, transparency, and a balance between populist and technocratic action. Moreover, most ingredients of this mixture have been repeatedly endorsed by all UN member states. We believe that the economic and cultural power of these nations will continue to be used to endorse these values globally. Furthermore, we expect that a deepening understanding of the problems facing economic, judicial, and political systems around the world will improve future action. However, success is dependent on at least three major factors. First, despite their own internal difficulties, the dominant bloc of nations will need to choose to lead the world towards peace, prosperity, human rights, and good governance. Second, powerful nations need to use their influence to encourage the constructive evolution of existing political systems; in almost all cases, violent revolutions and regime changes have caused power vacuums that lead to widespread and longstanding human suffering. Change of this sort will be difficult and halting, but it is crucial. Third, the peoples of the world will need to find this form of governance to be satisfactory. Failures on any of these fronts are possible and would likely lead to humanity experiencing ongoing political friction, violence, and an undersupply of global public goods. We propose new and stronger UN institutions as the primary embodiments of global governance. Institutions within the UN system tend to be based on strong humanist and egalitarian principles. As we explore later, these institutions are also under constant scrutiny by diverse actors to ensure that they follow these principles. We recommend the permanent allotment of capacity and attention to UN reform. When this has been done on a temporary basis in the past, it has succeeded in reframing major challenges facing the UN in important ways. Judging by the moral character of prior and ongoing strategic UN initiatives, we expect future efforts to be oriented towards the wellbeing of all humans. We believe nations must adopt a holistic perspective on security based on the mounting evidence that large-scale violence emerges primarily from solvable social and economic issues. As we have already seen with the rise of international terrorism, unstable regions also threaten the wellbeing of global citizens regardless of proximity. Such a shift would mean that nations will increasingly focus on global economic and political development, including a significant increase in official development assistance from wealthy nations. Even small steps in this direction show great promise for solving key global development problems, sowing global goodwill, and positively influencing global norms – all of which make future cooperation and prosocial action among nations more likely. Widespread automation of economic production poses an enormous challenge to the economic, political, and moral fabric of our societies. Solving this problem requires that nations implement policies to stop runaway economic inequality and provide hopeful futures for their people. Societies that navigate this transition successfully will be well-positioned to cooperate deeply on the global stage and thus help create a more hopeful future for all of humanity. The global digital commons, if defended from attack, privatization, and corruption, will soon allow conversations to span all geographies, nations, and languages. When such conversations are conducted in a way that helps people understand each other’s humanness, participants are prone to feel increased empathy and sympathy. In short, the global digital commons will allow humans to increasingly recognize each other as people who are worthy of moral concern. Lastly, we posit that the rising strength and diversity of global voices in the multi-focal myriad will shape global governance for the good of all. As governance systems evolve, nations and peoples will increasingly use all of the tools of their diplomatic depth to ensure that the moral foundation of global governance is in alignment with their own deeply held values. Amplified by evolving tools and networks like the global digital commons, these global voices are already shaping events throughout the world. The rising tide of the multi-focal myriad will be strongly informed by global ethical norms, old and new, thus leading to a continued rise in the moral standards to which global governance is held. Making a consequential decision that affects the entire world will always be a messy and challenging process. Humanity has succeeded numerous times in the past, but there are strong reasons to believe that the challenges we face now and into the future will be more difficult than those solved in past decades. No one is a veto holder over collective action in the world today. If a decision-making body is blockaded, there are generally other structures that can step in to fill the void. For example, even the most notorious veto system – that of the five permanent members of the UN SC – can be overruled by a two-thirds vote in the GA. Thus, a motivated supermajority of the GA can take specific action with regards to peace and security regardless of a veto – the casting of which represents only a lack of consensus among particular great powers. Furthermore, the world is trending towards increasing multipolarity, making it very likely that future institutionalized power structures will not place global veto power in the hands of any nation or person. However, the rise of multipolarity means that majorities or even supermajorities may be needed to accomplish anything of significance. This is a huge challenge for the decision-making capacity of global governance. Next, we will explore some of the ways that our recommendations help to improve this situation. We propose that agreements be embodied in narrow-mandate global institutions that have the power to solve problems within their domain. Once such an institution is built, it has a good chance of providing a global public good consistently despite the ebb and flow of political beliefs. Increasingly, aspects of political decision-making can be institutionalized into transparent rule-bound structures that attempt to fulfill the mandates given to them by the nations of the world. This evolution will allow us to slowly transform areas of turbulent politics into durable goal-driven action. Additionally, we posit that building capacity and momentum for UN reform will lead to improvements in the structure and function of multiple major global institutions within the next few decades. We expect these changes to improve global decision-making and breathe new energy into global governance. We recommend that transgovernmental networks, such as the coalition of cities, be created and embraced. These alternative governance networks may be capable of identifying problems and acting on them far more quickly than national or international governments. The reverse is also possible, where nations choose to work together on problems that have not been solved by any other governance network. Constructive action can be undertaken by a single layer or network of governance even if other layers or networks are paralyzed – a pattern that we term jurisdictional optionality. An expanded and better-funded UN will be better able to make decisions. We proposed ways to make existing funding sources more reliable as well as new funding sources that the UN is well-positioned to tax. Furthermore, if societies implement the necessary policies to smoothly navigate the transition toward widespread automation of the economy, all levels of government can benefit from additional resources. As with any institution, the UN’s priorities today are shaped by its funding sources. If funding can be solidified and diversified over time, this will reduce the bias in UN decision-making. The multi-focal myriad is a decision-making system capable of rapid and deep analysis on many topics simultaneously. Ideas can spread across the world and attract enormous attention in mere hours. Political pressure can be applied on a massive scale within days. The emerging global digital commons facilitates the creation, communication, and refinement of thought and opinion – crucial faculties for decision-making. If a majority of the myriad seeks a political outcome, they can use the many tools of diplomatic depth to put tremendous pressure on decision-makers. If pursued with vigor, the structural evolution and policies we described should enable global governance to become much more effective in the coming decades. New narrow global institutions will be built to address emerging challenges, governance networks will proliferate, and global cooperation will gradually improve as the world’s nations grow towards similar priorities and earn each other’s trust. Every major development area we describe is aimed at improving the effectiveness of governance. The first challenge of enforcement is knowing when enforcement is necessary. We propose that narrowly-mandated global institutions be tasked with overseeing the creation and maintenance of every global public good. Ideally, the institutions themselves would be able to provide the public good directly from their own capacity. As UN funding stabilizes and expands, we believe that central provisioning of moderately expensive global public goods will be achievable. More commonly, institutions would have narrower powers, such as the capacity and lawful authority to inspect and report on compliance with agreements. Though this sort of action may seem indirect, it can be highly effective, as evidenced by its broad use in existing agreements. Further to this, the multi-focal myriad has tremendous capacity to examine adherence with agreements and put pressure on states to comply. The implementation of an agreement with widespread support will be watched closely by all parties. The diplomatic depth of nations and peoples will be deployed to establish the expectation of compliance and to pressure defectors. Enormous power can be wielded in this way, enough that even major powers will not be able to ignore it. Several of our proposals directly increase the human and material resources allocated to global governance. In particular, we propose creating new global institutions and strengthening existing ones. We also described how UN funding can be made more reliable and then expanded dramatically. The stabilization of traditional funding will be about as equitable as existing UN funding. Expanded funding would be drawn primarily from conspicuous global resource consumption, extraplanetary jurisdictions, and a global wealth tax. These new funding sources are designed to be a progressive tax on the population, where the cost to each individual will correlate strongly with their ability to pay. A central theme of this work is the incremental improvement of the UN and its institutions – all of which are extremely professional, transparent, rule-bound, and accountable. If global institutions didn’t have these qualities, nations would not consider ceding power to them. In lieu of a centralized vetoless governing body, the trust and legitimacy earned by global decision making is based primarily on the strength of the majority in favor of a given decision. If the global order trends towards implementation of a decision, it means that the decision almost certainly has strong and broad support across governments and cultures. The open decision-making structures of the UN and democratic nations are often home to discordant, even divisive, perspectives. Thus, when these open political systems succeed in making major commitments, they tend to be credible. Broader trends in society are also pointing in the direction of increased transparency. For example, major efforts are being made today towards open data, open source software, and sousveillance. As the global digital commons has evolved, the multi-focal myriad has increasingly set the expectation that information be open and structures be transparent. Nurturing and defending the global digital commons will allow this positive evolution to continue. We recommend policies that approach the problem of trust by directly fostering positive action. For example, the adoption of holistic security by even some leading nations will prompt a significant increase in investment toward the economic and political success of developing countries. While action like this might consume only a tiny fraction of the resources of a wealthy nation, it would have a powerful effect on how they are perceived by the peoples of the world. In the long run, prosocial governments sow goodwill and trust in the world, crucial factors for the ongoing development of global governance. The state of global governance is evolving slowly but steadily. UN institutions have gained trust and an increasing range of mandates while economic integration and globalization have progressed. Our recommendations do not involve a sudden upheaval or revolutionary change to existing structures, but we do propose that the evolution of governance be pursued very intentionally rather than merely in response to crises. For example, we state that resources should be deliberately mustered for UN reform, and that the relationships between transgovernmental networks and UN institutions be formalized over time. We posit that the world order will continue to be roughly a democracy among nations for the foreseeable future. National governments universally want to have a say in global governance, so no other system seems likely to emerge. When the nations of the world are finally ready to deepen or replace the UN Charter, we expect that the new system will include a provision for changing its own fundamental rules – just as the UN Charter did. One could imagine for example that a supermajority of both nations (one country per vote) and a supermajority of population (one person per vote) could be eventually established as the dual requirements for changing the fundamental rules of the global system. As explored earlier, our recommendations embrace jurisdictional optionality, where valuable effort can be initiated by a single layer or network of governance even if other layers or networks are paralyzed. The multi-focal myriad will tend to focus its influence on the decision-making structures that seem most likely to take action on a given topic. Not all structures have the power to provision global public goods, but goal-directed action by even a single layer of governance may be the crucial first step that the world needs to take on a journey towards the full realization of a public good. As a safeguard against abuses of power, governments can use their diplomatic depth to exert influence and encourage good behaviour. Depending on the severity of the abuse of power being faced, this influence could range from strong words all the way to shattering military conflict. However, national governments are not the only actors that will be involved in this process. As global governance evolves during the coming decades, protections against the abuse of power will be increasingly focused on international institutions and decision-making processes because that is where power must be slowly accumulated if we are to have true global governance. As more authority and a wider range of mandates are entrusted into these institutions and governance networks, the primacy of national governments as the sole major actors on the international scene will progressively decline. This slow transfer of authority will encourage and coexist with increased economic and political integration between nations. The majority of UN institutions are narrowly mandated and are thus incapable of infringing significantly on the sovereignty of nations. This approach should be built upon as it allows great progress to be made in global governance even if nations retain all of the core aspects of their sovereignty. Slowly entrusting additional power to narrowly mandated institutions will provide many opportunities to evolve them towards extremely trustworthy structures. In this sense, the inherent conservatism of an evolutionary approach to global governance institutions is very valuable; it is extremely unlikely that we will build ineffective, abusive, or unaccountable institutions. Furthermore, global institutions are held to task by the nations and peoples of the world. As discussed earlier, global institutions are typically designed to be extremely open and transparent, thus exposing them to extensive scrutiny by other parties. Sometimes this systematic scrutiny is built into their founding documents. We expect that the design of global institutions will continue to lead to them being professional, transparent, rule-bound, and accountable into at least the moderate future. Ultimately, nations will continue to be the arbiters of global governance until humanity has implemented a sovereign global government, a prospective political change that we expect to take at least several decades. By that time, humanity will have accumulated a great deal of experience with building accountable global institutions of increasing power. When humanity finally builds a sovereign global government, its design will have been honed through numerous narrow implementations that will have demonstrated consistent accountability and appropriate use of power. The creation of this document and the ideas within it was a project that spanned eight months and touched upon the lives of dozens of people. We the authors are deeply grateful for the crucial support we received from those around us. In fact, many of the key ideas of this work came about due to the conversations we had with this broader group. They deserve credit for the ideas in these pages. All oversights and errors remain our own. S. Philips Johnson was an integral part of many discussions that shaped this work. His influence touched every part of this work, and it would not be an exaggeration to say that without his efforts, you would now be reading a very different document. Special thanks also goes out to the broader team, including Anya Petrova, Laurianne St-Onge, Chris Kriska, Deanna Fink, and Mitchell Reardon. Without your insight and thoughtful conversation, many of these ideas would not have taken shape. Finally, thank you to our early readers Garrick Monaghan and Jacenta Murch. You brought fresh eyes, hearts, and perspectives when we needed them most. Ben Harack is an aspiring polymath who has produced impactful publications in several fields, including energy policy, city planning, and humanity’s future. His writings have appeared in the Huffington Post and discussed widely in both specialist and mainstream media, including the New York Times, Vox, and the Economist. He is the co-founder of the Vision of Earth project (VisionOfEarth.org), an independent group of volunteers that examine crucial questions about humanity’s future. Kyle Laskowski is a physicist, technologist, and writer. He is a cofounder of the Vision of Earth project (VisionOfEarth.org), where he focuses primarily on the human impacts of energy policy and the technical prospects for humanity’s future in space. He is also helps manage the Realism Overhaul project (github.com/KSP-RO), which modifies Kerbal Space Program, a popular space exploration computer game, to more accurately reflect the difficulty of navigating space as well as the true capabilities of past, present, and prospective technologies. Robert Bailey is a professional technologist and strategic manager who has led initiatives to improve the delivery of civic services in major North American cities. He is avidly interested in the dynamics of governance, particularly the evolution of political unions. He travels widely, aspiring to understand the variety and depth of human cultures. Jeanette Marcotte is a professional geologist, personal trainer, and nutrition coach. Her professions have led her to live and work in many places, ranging from cities to remote camps. She is passionate about quality of life and and discovering ways for institutions to improve lives at the individual level. She is interested in further exploring ways that policy can create practical positive outcomes for society. Deep Datta considers himself a global citizen and a polymath with skills in media studies, web development, academia, and foreign affairs. His immediate obsession is in building impact-focused technology. He spent years working in the private-sector with engineering solutions teams at Thomson Reuters and Rocket Fuel Inc. His last role involved leading technical communities at Benetech Labs where he helped prototype humanitarian applications and built partnerships with dozens of nonprofits and tech companies in Silicon Valley. He’s currently working on his own startup in financial inclusion called Konviv, which is a mobile money management platform that uses next generation machine learning tools and natural-language-processing to help the underbanked. Steven Kuski is an economic statistician and civil servant. He peruses resilient and pragmatic solutions to the problems of governance. He is a dispassionate observer of humanity. Sam Jaques is a mathematician interested in the control of information. He likes maps, flashcards, and algorithms, and supports the Effective Altruism movement.